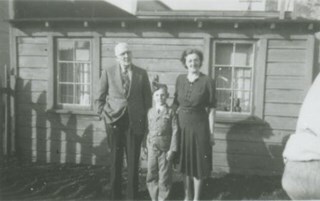 Photograph of (left to right) George Nichols, Jack Nichols and Alma Nichols, in the yard at the back of Nichols Meat Market at 4016 Kingsway (later renumbered 4548 Kingsway). Jack Nichols is wearing a uniform. Photograph of (left to right) George Nichols, Jack Nichols, Alma Nichols, Mickey McGuire, and Clara [last name Nichols?] in the yard at the back of Nichols Meat Market at 4016 Kingsway (later renumbered 4548 Kingsway). Caption at bottom of photograph reads, "Dad, Jack, Mom, Micky and Clara"
Photograph of Clara [last name Nichols?] and Jack Nichols in the yard at the back of Nichols Meat Market at 4016 Kingsway (later renumbered 4548 Kingsway). 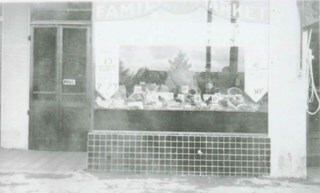 Photograph of the front window of the Nichols Family Meat Market at 4016 Kingsway (later renumbered 4548 Kingsway). The phone number was Carlton 920. 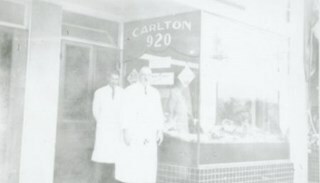 Photograph of George F. Nichols and an employee standing outside of the Nichols Family Meat Market at 4016 Kingsway (later renumbered 4548 Kingsway). The phone number was Carlton 920. 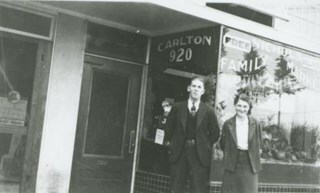 Photograph of brother and sister George Nichols, Jr. and Ruth Nichols standing outside of Nichols Family Meat Market at 4016 Kingsway (later renumbered 4548 Kingsway). The phone number was Carlton 920. 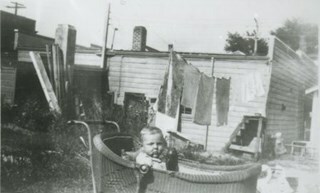 Caption at bottom of photograph reads, "George Geodfrey and Ruth Nichols"
Photograph of Jack Nichols in a baby carriage in the yard at the back of 4016 Kingsway (later renumbered 4548 Kingsway). 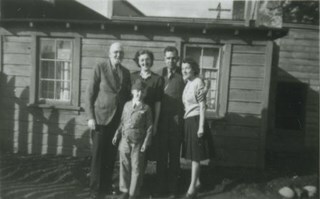 The Nichols family lived behind Nichols Family Meat Market on Kingsway. There is laundry hanging on a line. 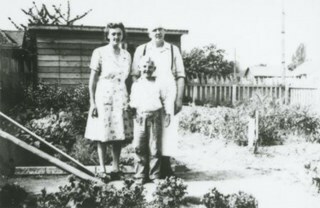 Photorgraph of (left to right) Alma, Jack and George F. Nichols in the garden at 4016 Kingsway (later renumbered 4548 Kingsway). The family lived behind the Nichols Family Meat Market on Kingsway.